There is much to be thankful for! 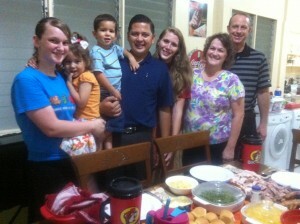 This Thanksgiving we were thankful for friends as we celebrated the holiday with our missionary partners. We were also thankful for technology as we contacted our loved ones back home in the USA. At one time in history a missionary left their family, not knowing when they could communicate again. Yes, there is much to be thankful for. We pray you all had a blessed holiday with your loved ones! As we celebrated Thanksgiving this year I found myself reviewing all that has happened in my life and there is just so much to be thankful for! 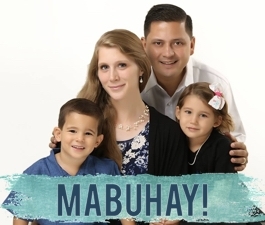 Who would have thought that by 2012 I would be in the Philippines, have a lovely wife, a precious little girl, and baby number two on the way! Our first seven months on the field have been so greatly blessed. We have benefited from the wisdom and friendship of the Lewis family, who have helped us sidestep many obstacles and taught us how to face others. We were also able to find a house quickly, enabling us to settle into our new home. In the short time we have been here we have even seen people trust Christ as their only way to heaven. I know a lot of work and planning has been done to get us here in Cebu but I also realize that without the Lord our plans are futile. In this Thanksgiving season I have to direct my praise to the One Who has enabled me to serve Him. My very breath, my life is in His hands. He has given me health and strength, something which a person often takes for granted. I’m so thankful for His love and protection! Hope you all had a wonderful Thanksgiving and took time to remember what the Lord has done for you! I pray you all had a wonderful Thanksgiving close to your loved ones! We were able to spend the day celebrating with my parents in New York. This was the first time my wife and I have been able to share this special day with my parents since we’ve been married. It was so nice to relax and enjoy family. 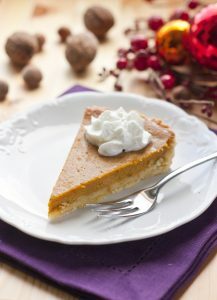 Thanksgiving is also a wonderful time to reflect on all the blessings God has given throughout the year. We certainly have been blessed! We praise the Lord for all He has done and all that He will do in the future!